A source confirmed to TigerNet Friday night that the decision was made recently (not made by the Board of Trustees). TigerNet was told that it was a “campus decision” and it had been a “long time coming.” During the 2017 season, only half the number of balloons were released as compared to 2016. The tradition started during the 1983 season. 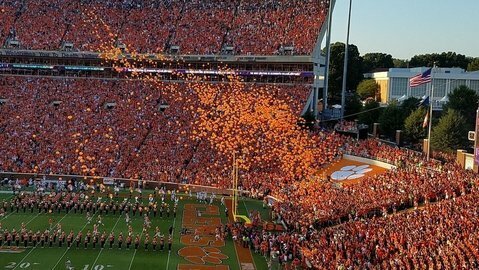 According to clemsontigers.com, during the 1983 season, Student Body President Mark Wilson came to Athletic Director Bill McLellan with the idea of breaking the existing Guinness Book of World Records mark for a balloon launch. Wilson thought it would be quite a spectacle as the Tigers ran down the Hill prior to the Maryland contest, Clemson’s final home game of the season.